KSHP’s vision and mission statement is to be a center of excellence promoting eco-health for economic development by safeguarding and enhancing eco-health for improved livelihoods through research and extension services to enhance adoption of technologies by local communities for food security and ecosystem health. KSHP operates in a cosmopolitan community whose main activity is farming. The people in this community draw their waters from wells, protected springs, borehole rivers, hand pumps and tanks especially during rainy seasons. KSHP conducts trainings at grassroots levels on water, sanitation and hygiene with an emphasis household water treatment using biosand water filters. The Biosand water filter is a modified form of traditional slow sand filter in such a way that filters can be built on a smaller scale group and operated intermittently. These modifications make the Biosand water filter suitable for household or small groups. The Biosand filter is produced locally anywhere in the world using materials that are readily available. The Biosand filter is used as part of multi-barrier approach which is the best way to reduce the health risk of drinking unsafe water. Barriers from pathogen occur in each of the steps; protection of the source of water, sedimentation, filtration and finally safe storage after filtration. The Biosand water filter when installed with required ratio has proved that disease causing pathogens found in contaminated water (E-coli) are removed ninety-nine percent. It is easily maintained by the household therefore it does not require skilled personnel to operate and carry out daily care and maintenance. The Biosand filter is irreplaceable when well-kept it has a life span of up to eight generations. Construction and installation of the biosand water filter is done by community members themselves with a minimum training. incepted, it is one cheap, appropriate, accessible and easily managed method of household water treatment. There are also reduced incidences of waterborne diseases among the vulnerable persons. 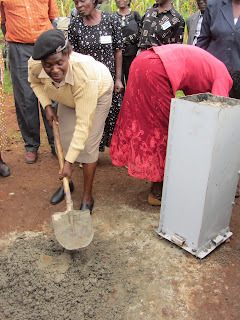 Income generation among women and the youth has increased with the implementation of Biosand filters. Immediately after the community was trained on construction and installation of the Biosand water filter the demand for filter is high, this illustrates that filters are widely accepted regardless of religion, race, age and status. friendly unlike boiling water which needs firewood (fuel). Apart from water, sanitation and hygiene, the community also participates in environmental promotion practices i.e. agro forestry, riverbank protection, re-afforestation and soil erosion conservation among others all aimed climate change and mitigation. Kilili as an organization empowers the community on renewable energies where women are trained on solar cooking, making solar cookit and fireless cookers as an income for women. This has been a tremendous activity for women, they enjoy practicing, it cuts down the cost of fuel, saves time and energy as well as mitigating climate change.